Lessons on the Anniversary of the Greensboro Massacre. November 3, 1979, KKK and Nazi members opened fire on a multiracial group of demonstrators who were gathering at a Black housing project in preparation for an anti-Klan march. Most of the five victims were associated with the Communist Workers Party (CWP) — a militant, multiracial organization which had been organizing in the South against the Klan. Anne Braden took a lead in organizing a response, including a massive rally at which she spoke (as seen in the film). This article describes what happened and the many years of efforts to bring about justice. This is a history that should not be forgotten. Anne Braden Institute for Social Justice Research at the University of Louisville was founded in 2006 to honor Braden’s work and legacy as a longtime racial justice organizer, educator and journalist. The Institute seeks to advance public understanding of the U.S. civil rights movement, both its powerful history and its unfinished agenda of racial and social justice. The ABI vision is that scholarship and activism inform and strengthen each other and sustain social justice locally, regionally, nationally and globally. The website has links to many research resources. Subversive Southerner: Anne Braden and the Struggle for Racial Justice in the Cold War South – by Catherine Fosl. A riveting oral history biography based on extensive interviews, the book focuses on Braden’s formative years leading up to and through the Wade Case, and her controversial role within the growing Civil Rights Movement. It is also a significant social history of how racism, sexism, and anticommunism intertwined in the 20th-century South as ripples from the Cold War divided the emerging civil rights movement.Throwing Off the Cloak of Privilege : White Southern Women Activists in the Civil Rights Era – by Gail S. Murray. An excellent collection of essays, Catherine Fosl’s chapter, “Anne Braden and the ‘Protective Custody’ of White Southern Womanhood,” uses Braden’s story to explore what it meant to be white and female and stand up to segregation in the South.Deep in Our Hearts: Nine White Women in the Freedom Movement. Anne Braden was a mentor to many of these women who relate their experiences of coming of age in the 1960s while committing themselves actively and passionately to the struggle for racial equality and justice.Hands on the Freedom Plow: Personal Accounts of Women in SNCC. 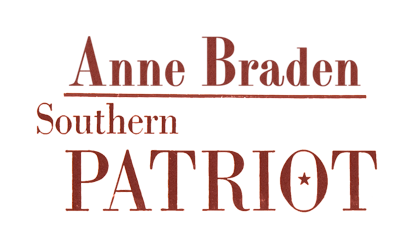 The significant role of women in the Civil Rights Movement has too often been overlooked, but these powerful first person narratives from fifty-two women help to tell herstory.The Anne Braden:Southern Patriot Research Bibliography is a detailed listing of reference material. Showing Up for Racial Justice, or SURJ, is a national network of groups and individuals organizing white people for racial justice.Through community organizing, mobilizing and education, SURJ moves white people to act as part of a multi-racial majority for justice with passion and accountability. Kentucky Alliance Against Racist and Political Repression. Anne Braden was a founder of this organization that is now primarily focused on organizing in Louisville, KY.
Janee Woods: Becoming a White Ally to Black People in the Aftermath of the Michael Brown Murder– An insightful commentary on some ways for white people to become white allies who are engaged thoughtfully and critically in examining the situation in Ferguson and standing on the side of justice and equity.